Solar indicators were lower this week, while geomagnetic indicators were higher. Compared to the previous seven days, average daily sunspot numbers in our reporting week (March 10-16) were down 12.7 points to 51.7, and average daily solar flux was down 3.2 points to 93.6. Average planetary A index was up 2.8 points to 15.7, and average mid-latitude A index increased from 8.6 to 12. 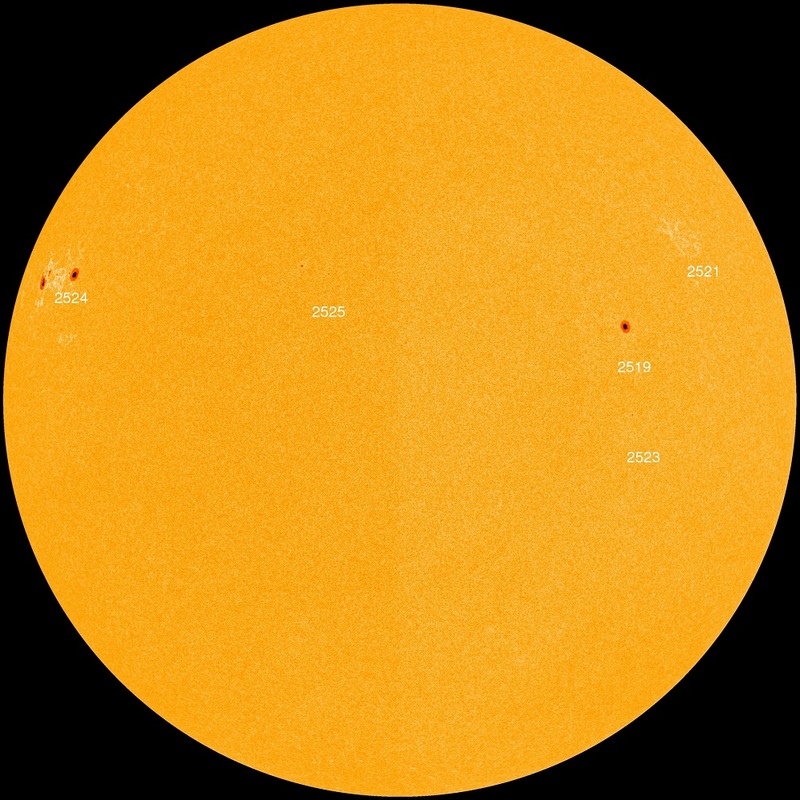 The latest forecast has a predicted solar flux of 95 on March 18-19, 90 on March 20, 85 on March 21-24, 90 on March 25, 95 on March 26-28, 100 on March 29-31, 95 on April 1-9, 93 on April 10, 90 on April 11-15, 95 on April 16-17, and 90 on April 18-19. Flux values then rise to 100 on April 25-27. Predicted planetary A index is 16, 8, 6 and 5 on March 18-21, then 6, 8 and 10 on March 22-24, 5 on March 25-31, then 8, 30, 25 and 8 on April 1-4, and 5 on April 5-6. Planetary A index rises to 25 on April 11 and 30 on April 29. Petr Kolman, OK1MGW, predicts geomagnetic conditions will be mostly quiet on March 18-19, quiet on March 20-21, mostly quiet March 22, quiet to unsettled March 23-24, quiet on March 25-26, quiet to unsettled March 27, quiet to active March 28-29, quiet to unsettled March 30, mostly quiet March 31 to April 1, active to disturbed April 2-3 (although the forecast is uncertain for these two days), quiet to active April 4, quiet to unsettled April 5-6, quiet to active April 7-8, mostly quiet April 9, active to disturbed April 10-12 and quiet to unsettled on April 13. Petr expects an increase on solar wind from coronal holes on March 23-24 (although like the April 2-3 forecast, this is uncertain) March 27-29, April 1-4, April 7-8, and April 10-12. Tomas Hood, NW7US, has posted a new, breathtakingly beautiful video of our Sun, at https://www.youtube.com/watch?v=HgP0e1VHBxc. This high-definition video shows the Sun in the 171-angstrom wavelength of extreme ultraviolet light. It covers a time period of January 2, 2015 to January 28, 2016 at a cadence of one frame every hour, or 24 frames per day. This time-lapse is repeated with narration by solar scientist Nicholeen Viall and contains close-ups and annotations. The Sun is always changing and NASA’s Solar Dynamics Observatory is always watching. Launched on February 11, 2010, SDO keeps a 24-hour eye on the entire disk of the Sun, with a prime view of the graceful dance of solar material coursing through the Sun’s atmosphere, the corona. SDO’s sixth year in orbit was no exception. SDO’s Atmospheric Imaging Assembly (AIA) captures a shot of the Sun every 12 seconds in 10 different wavelengths. The images shown here are based on a wavelength of 171 angstroms, which is in the extreme ultraviolet range and shows solar material at around 600,000 Kelvin (about 1 million degrees F). In this wavelength it is easy to see the Sun’s 25-day rotation. During the course of the video, the Sun subtly increases and decreases in apparent size. This is because the distance between the SDO spacecraft and the Sun varies over time. The image is, however, remarkably consistent and stable despite the fact that SDO orbits Earth at 6876 MPH and the Earth orbits the Sun at 67,062 miles per hour. Scientists study these images to better understand the complex electromagnetic system causing the constant movement on the Sun, which can ultimately have an effect closer to Earth, too: Flares and another type of solar explosion called coronal mass ejections can sometimes disrupt technology in space. Moreover, studying our closest star is one way of learning about other stars in the galaxy. NASA’s Goddard Space Flight Center in Greenbelt, Maryland built, operates, and manages the SDO spacecraft for NASA’s Science Mission Directorate in Washington, DC. Tomas, the propagation columnist for both CQ Amateur Radio magazine, and The Spectrum Monitor, is also offering a self-study course on space weather and the propagation of radio waves, at http://sunspotwatch.com/swc. This weekend the vernal equinox occurs at 0430 UTC on Sunday, March 20. Now there is more energy from the sun impacting the ionosphere in the Northern Hemisphere, and this should enhance HF propagation. Toward the end of last week’s bulletin (http://www.arrl.org/w1aw-bulletins-archive/ARLP011/2016) we posted a question from Steve Shorey, G3ZPS, and a reference to a K9LA resource. K9LA responded this week: “My article doesn’t say much about what actually happens in the atmosphere when the K index spikes up – it just shows that the ionization can be enhanced, and we have a model that could help show what’s happening real-time. For more information concerning radio propagation, see the ARRL Technical Information Service at http://arrl.org/propagation-of-rf-signals. For an explanation of the numbers used in this bulletin, see http://arrl.org/the-sun-the-earth-the-ionosphere. An archive of past propagation bulletins is athttp://arrl.org/w1aw-bulletins-archive-propagation. More good information and tutorials on propagation are at http://k9la.us/. Click on “Download this file” to download the archive, and ignore the security warning about file format. Pop-up blockers may suppress the download. Sunspot numbers for March 10 through 16 were 61, 48, 56, 43, 57, 44, and 53, with a mean of 51.7. 10.7 cm flux was 95, 94.2, 95, 92.6, 93.4, 94.1, and 91, with a mean of 93.6. Estimated planetary A indices were 10, 23, 13, 4, 14, 24, and 22, with a mean of 15.7. Estimated mid-latitude A indices were 7, 21, 11, 4, 11, 17, and 13, with a mean of 12.